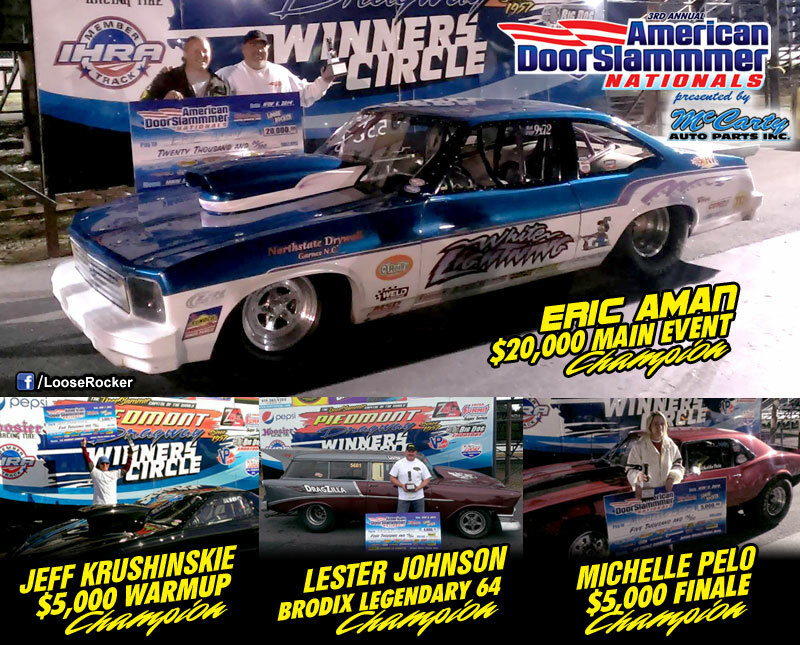 Julian, NC – A record 225 entries shared in over $77,000 in cash and prizes at Loose Rocker’s 3rd Annual American Doorslammer Nationals presented by McCarty Auto Parts, hosted by Piedmont Dragway, November 7-9, 2014. Competitors flocked to “The Doorslammer Capitol of the World” in Julian, NC from as far away as Georgia, Ohio and even Canada to vie for the $20,000 top prize, which also featured a round money increase. Mount Olive, NC’s Eric Aman, a former IHRA Div. 9 Modified ET Champion proved his mettle off the top bulb, wheeling the Ronnie Roberts Racing “White Lightning” Nova to the winner’s circle in Saturday’s $20,000 main event, which began with a stout field of 225 entries. Aman held off engine builder and TS/TD standout Brett Nesbitt in the finals, using an .027-backed dead-on 5.554 to encourage Nesbitt’s 5.997 breakout (6.00 dial-in), despite a .006 reaction time. Aman advanced to the finals by defeating last year’s $5K Finale victor Frank Mark, with a .010 at the tree and an .01-over 5.560 to Mark’s .013 and 7.313 (7.29). Nesbitt had the semifinal bye run. Saturday night also featured the BRODIX Legendary 64 Shootout, with $4,000 on the line plus a $1,000 Brodix gift certificate. Lester Johnson of Cynthiana, KY and his fan favorite “Dragzilla” Nomad wagon treated everyone to not only one massive wheelstand spectacle after another, but also a master class en route to the winner’s circle. Johnson dealt a .006 package to Chad Duke in the semifinals, and cruised to a .003 package in the finals after multi-time Loose Rocker Champion Shawn Carpenter met the bulb coming on for an -.018 red from his Shawn’s Body Shop & Powdercoating Camaro. Carpenter put a holeshot on John Hill in the semis to get his shot at Johnson. Loose Rocker’s popular “FAT $5K” format, featuring $100 round money, bookended the weekend, with both races boasting 198 entries in the first round of competition. Shamokin, PA’s Jeff Krushinskie used his quick and consistent Firebird to pick up his ninth big check of the season in Friday’s $5K Warmup final round against Nick Womack’s S-10. Krushinskie’s brutal .007, dead-on 5.157 pushed out Womack’s .003, 6.355 (6.37). In the semis, Womack stopped former IHRA Summit Box World Champion Joe Gary with a .001, 6.378 (6.36) to Gary’s .007 and breakout 5.468 (5.48). Krushinskie had the semifinal bye run, where he showed his hand with a -.002 tree and a dead-on 5.152. Sunday’s $5K Finale featured more cutthroat competition. Michelle Pelo of Jacksonville, NC and Chris Dean were undoubtedly the class of the field, with both drivers still double-entered at nine cars. Although each dropped one entry in the sixth round, they were each able to carry their remaining entry to the finals. Pelo leveled a crushing .003, dead-on 6.409 for an .012 package, leaving Dean’s .012 light to suffer a 6.034 (6.04) breakout. In the semis, Pelo took the solo ride, while Dean benefited from a redlight start by Greg Walker. Special awards included C&C Auto Glass Dash for Cash presented by Summit Racing Equipment won by Michael Paschal of Pleasant Garden, NC, the ImagineThatCustoms.com Best Appearing Car awarded to the duo of Ed and Stephanie Beyer of Beavercreek, OH, and Redline Speed Shop Best Engineered Car earned by Matt Weston of Hendersonville, NC. Additionally, thousands of dollars worth of prizes were presented to dozens of racers courtesy of Abruzzi Racing Transmissions and Converters, NitroPlate High Temperature Coatings, Summit Racing Equipment, Mickey Thompson Tires, Auto Meter, Moser Engineering, Flatout Gaskets,ThisIsBracketRacing.com, and Loose Rocker Promotions.